Still, clear turquoise waters.....swimming off sun-baked rocks....gazing out over a hazy sea, where boats gently bob...it felt like a Greek island, but no, it was Devon in the Easter heatwave. This is Cellars Beach, at the mouth of the Yealm. It's a low tide beach, but it's not a problem when the tide is high because there is an enormous rock to sit on. As you do so you gaze out on the Mewstone and Plymouth Sound and the odd naval ship. The water was deceptive - it was very cold. 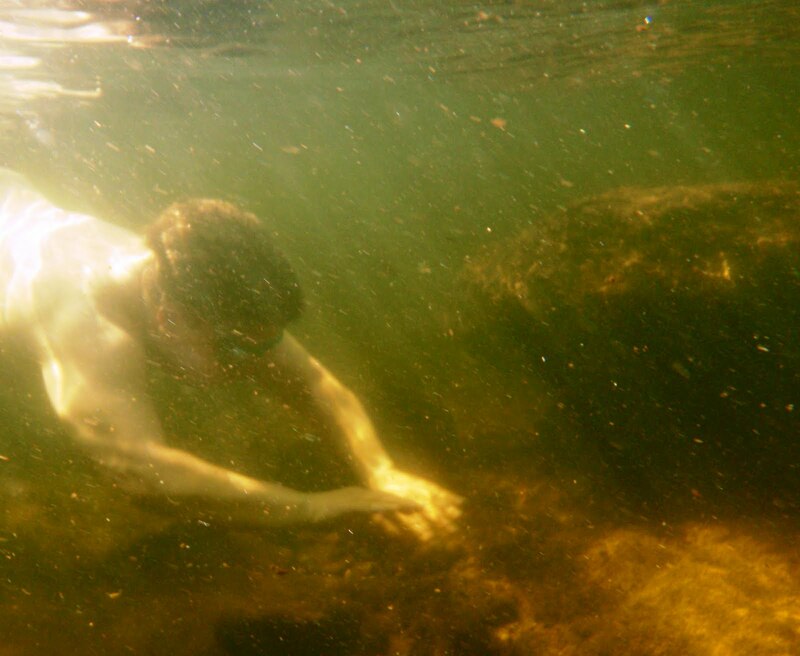 I swam for too long, enthralled by the crystal clear water and the intriguing underwater landscape. When I eventually came out I was chilled to the bone, despite the heat. Dartmoor in the moonlight is totally beautiful but also nerve-wrackingly strange. Everything was bathed in a silvery glow, and as I walked towards my swimming spot I could see my shape moving in a moonlit shadow. Suddenly, out of nowhere, there was the sound of thundering hooves. Not wanting a moonlit encounter with the four horsemen of the apocalypse or ineed a herd of spooked Dartmoor ponies I quickly left the area. I drove a bit further and approached from the other side. The moon was high and it was reflected perfectly in the still water: a round shiny disc. I walked in, and ripples slowly moved out, elongating the reflection. I slid in and floated around in the silence. Well, I say silence, but actually there was quite a lot of noise. Owls hooting, the occasional whinny of a pony, and odd rustles and snuffles. The feeling of total isolation - apart from the wildlife around - was overwhelming. Today it felt like summer. Warm and sunny and not a cloud in the sky. 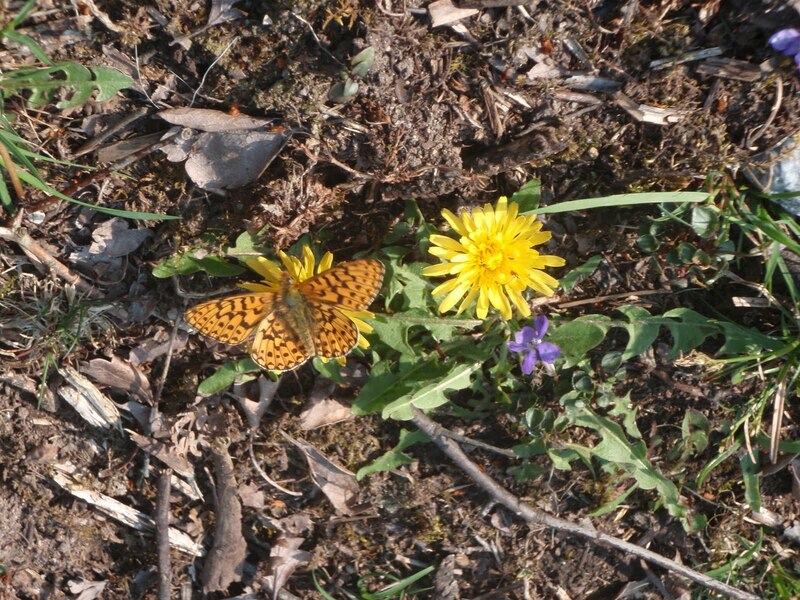 We headed for one of our local pools on the Dart, passing violets, wood anenomes, and celandines twinkling away like fairy lights in the ground cover. I was a touch apprehensive as I lowered myself into the river but the water was just wonderful. Yes it was fresh, even, dare I say, a little cold, but I soon got used to it and it was just beautiful to be in that silky and oh so clear water. 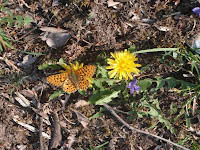 Walking back I saw a pearl-bordered fritillary butterfly - or possibly the small pearl-bordered fritillary I'm not sure - they feed on the violets. Kari was keen to come and see the wreck of the Louis Sheid, which I wrote about back in January (see previous entry). We headed for Thurlestone; it wasn't a particularly low tide so the top of the chimney wasn't visible. We found the wreck by swimming along, faces down, just looking; the water was lovely and clear and we swam over a stunning pink reef laced with all manner of seaweed, including some which was tinged fluorescent blue. Eventually we came across what looked to be the remains of a mast on its side, c overed with weed and barnacles; we followed it and arrived at the main body of the ship. The picture to the left shows the part of the ship - a chimney or a stempost - which protrudes from the sea on a very low tide. We met a couple of friendly divers who were also there exploring. We floated down the Yealm estuary with the outgoing tide, watching the river bed speeding along below. White cockle shells studded the bottom, brown bladderwrack swayed as we passed, and we swam over nets full of oysters. Bird tracks were still highly visible on the muddy bottom, and there was a magical moment when two silvery grey mullet swam past, giving off an eerie glow. It was a long swim; we were in the water for nearly three hours. The last leg involved swimming up Newton Creek to Noss Mayo, where we discovered a fatal flaw in our plan; we were now pushing against the current. Not a good idea when you're tired and cold. So out we got and walked the rest of the way. A friendly couple took pity on us as they saw us walking past their house, looking a trifle weary. They brought us out teas and coffees to provide the final boost to get back to the pub. It's great to get up close and personal with wildlife. Or is it?Anna and I were swimming at Hope Cove; all was well, the sun was shining, the seagulls were crying, and then we thought we spotted a seal. Great excitement; could this be the icing on the cake? But whatever it was disappeared, and we carried on swimming, thinking we must have been mistaken. I then felt something touch my leg; seconds later a whiskery face popped up just yards from us, casually spraying water out of its nostrils, and watching us carefully. For a few moments we revelled in the magic of being so close to a wild creature; how privileged we were etc etc. It then sunk back in the most laid-back fashion and disappeared underwater. The mood rapidly changed - where had it gone? Let me tell you, it's not a pleasant feeling being in the water while being encircled by a fat mammal that you can't see. It was swimming around underneath us, occasionally touching/nipping us. You've never seen us head so fast to the nearest cove. Once there, it laid siege, refusing to move from the water just off the beach. We were reduced to scrambling over the rocks to get back to the safety of dry land.